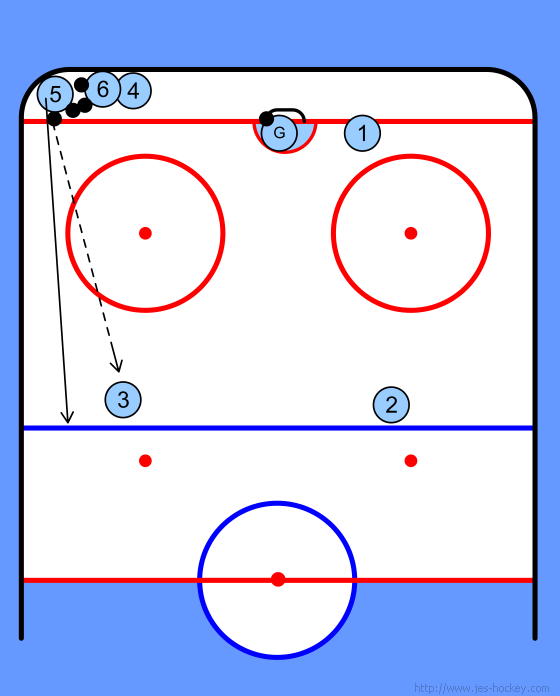 This is a passing drill as well as a timing drill. • Players line up as shown. • Player 1 starts by passing to player 4. He then skates out towards the blueline. • Player 4 passes to player 3. • Player 1 continues, rounding player 4's position. • Player 3 passes to Player 2. • Player 1 enters the zone. • Player 2 feeds player 1 with a pass. • Player 1 shoots on net. • Player 2 replaces Player 3. • Player 4 goes to end of line. Switch sides after 5 min. You may have to place a coach at the edge of the crease to keep players focused on where they should be going next.